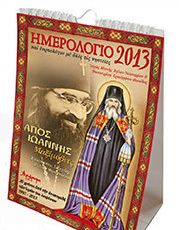 As every year, our monastery has printed a calendar and this year we have dedicated to Saint John Maximovitch. For orders please call the monastery's phone number (+30) 26340-44391. (09:00-14:00 & 18:00-21:00).